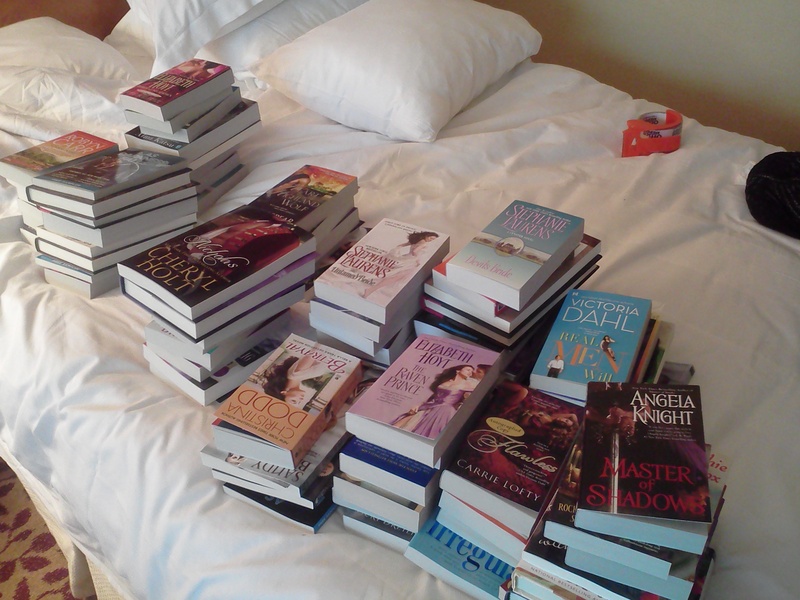 Recap of RWA12, plus other news! Man what a week that was! Last month (Wait. What??) was the Romance Writer’s of America’s national conference in Anaheim, California. Being an introvert, it took me awhile to recover when I returned home, hence the lateness of this post. Plus, I’ve also been busy polishing MUST LOVE BREECHES to send out and also subject to another round of queries (more on that at the end of the post). I thought I’d do a quick recap, but focus on only how the conference experience was for me, instead of giving a highlights recap as many have already done much better than I could. You know, I actually thought I would live blog the conference? Hahahahaha, giggle, sniff. Yeah. I barely tweeted. One of the main validations I received was the payoff in all the hard work I’ve put into my writing career in the last year, especially cultivating my social media profile. As conference roomie Jami Gold explained so well in her post, Social Media: An Introvert’s Secret Weapon, those of us who have cultivated our online presence saw the benefits when we arrived at the conference. I hopped on the airport shuttle to the hotel, and two other attendees were on board. Like a good newbie, I handed out my card, and one of them recognized my name! 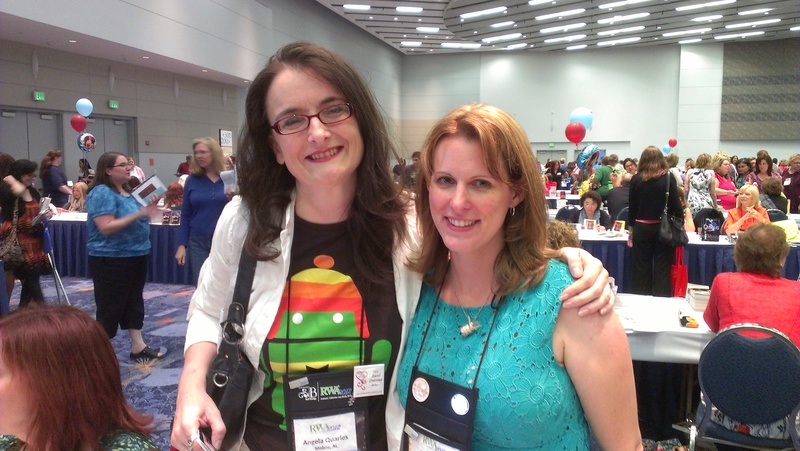 (Remember, I’m unpublished) — she’d ‘seen’ me on one of the RWA loops and we figured out which one and had a great convo on the drive. I checked in early (I arrived in CA around 9:30 a.m.) and then took the Amtrack into Los Angeles to meet my cousin for a late lunch. Like many in LA, she’s a struggling actress. She took me to Cole’s in downtown LA, which just oozed 1930s glam. 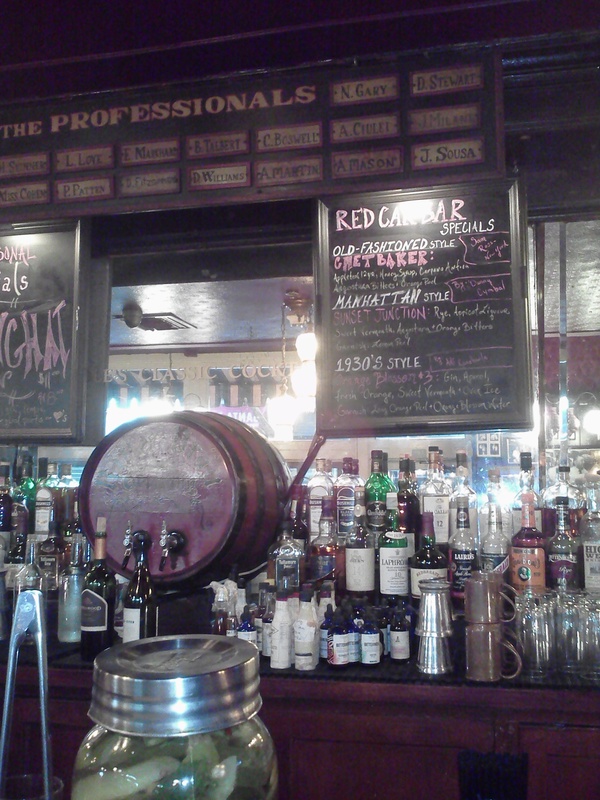 We caught up on our happenings and had a cute bartender who was kind of a geek about mixology, which was a lot of fun. He mixed me a very tasty Old Fashioned, which I only found out after my second one that he made it with 100 proof bourbon, yikes! Back at the hotel, I texted Jami and I finally got to meet her at the Literacy signing! We’ve been Beta reading buddies, and it was so great to finally meet in person, someone whom I’d been communicating and forming a friendship with first via Twitter, then email and then even phone (I hate talking on the phone). 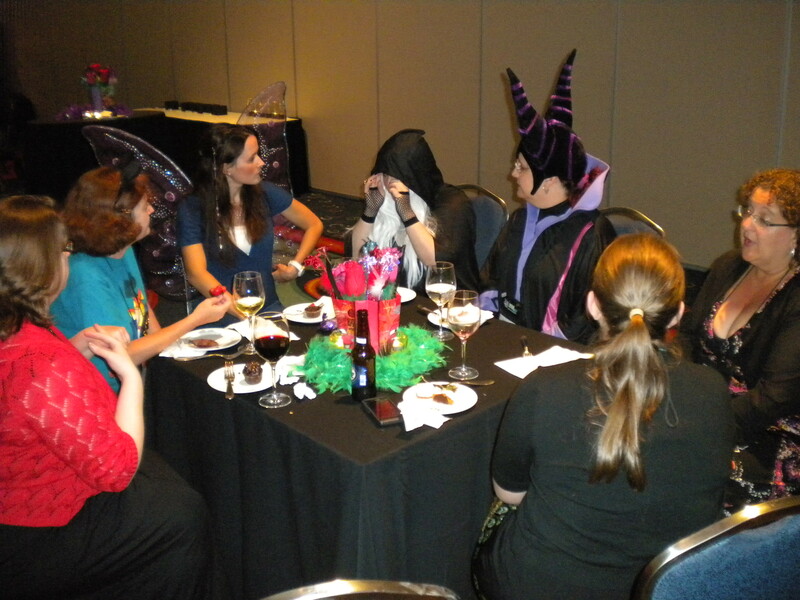 She was with Buffy Armstrong, who I’d interacted with on Twitter and we had a great time going around the tables. 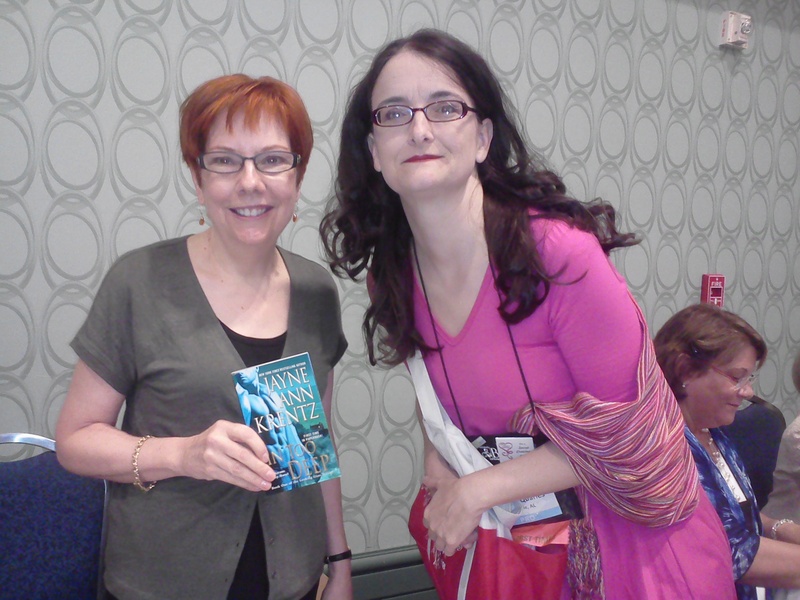 The room was filled with writers signing books, and the first person I had to locate and say “Hi” to was Tessa Dare. Sidenote: I have a little confession to make. My first fiction writing attempts began back in 2005 when I wrote Jane Austen fan fiction. I’d created a website called Longbourn Loungers for fans of the 2005 Pride & Prejudice movie and we had a lot of fun for a while indulging our addiction and exercising our writing muscles. My screen name was Plange. One of the participants was Tessa under the screen name Vangie and we Beta’d each others stories. I remember being blown away then by her prose. So we were super excited to see her succeed so well later on! I’m still in touch with several of the participants via Facebook and email and they were the ones who turned me on to NaNoWriMo back in 2009 which finally got me over my fear of writing novel-length fiction, and so I owe a huge debt to the Loungers 🙂 One of them is fellow Six Sentence Sunday participant Kate Warren who just published a fabulous ebook, Bridging the Gaps. Getting recognized at the Literacy signing! Another writer approached me by saying, “I have to meet the woman who wrote Must Love Breeches.” I think my jaw hit the floor. I know I look befuddled and probably stammered. First, I’m not published, so… Huh? How? Turns out she’d judged it in a writing contest and made me feel pretty dang good with her praise. What a way to start the conference 🙂 There was an irony to this too– we’d just walked away from Courtney Milan’s table and I said to Jami, “Meeting great writers like her makes me really wonder what the heck I think I’m doing trying to write,” and two seconds later, this lady walked up to me and said the above, LOL. Served me right for succumbing to the writer’s worst enemy: self-doubt. Hanging in our hotel room briefly Thursday night with Jami and Kat Latham and practicing our pitches. Kat was pitching to someone I’d pitched to at FF&P and I said I might still have my one-page dossier that I’d made on that agent if it’d help. So I opened my laptop and we were reading the bullet points I’d garnered on that agent back in March and then Kat says, “That’s me!” — I’d had a bullet point referencing something that agent had said on her blog, LOL. Pitching on Friday. I pitched to two agents and one editor and all went well. I wasn’t nervous and I think I have the FF&P conference to thank for that. It’s one of the main reasons I went, was to experience pitching in a less intimidating atmosphere before I went to Nationals. I got requests for partials from the agents (50 pages and 30 pages) and a full from the editor. The awards ceremony (though we didn’t get to sit at a table, despite being only 2 minutes late, so we missed dessert and had to stand for part of it until they brought in chairs). It was so wonderful seeing all those talented writers going up to receive their award and hearing their tales. It just felt like a big dose of girl power and was very inspiring! With the fabulous Amanda Quick/Jayne Anne Krentz. 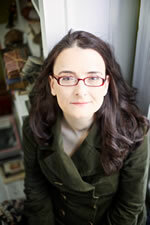 She’s the one, with her sparkling wit and humor, who inspired me to write romance! Jami Gold’s hand, and Buffy Armstrong adjusting her napkin… After the awards ceremony– we arrived two minutes late and so had no place to sit and missed out on dessert. So we ordered our own later! So right now, I’m doing one last exhaustive polishing revision of MUST LOVE BREECHES, before I send it to the ones who requested it and also do another wave of queries. Did you go to RWA? What did you learn? What stuck with you the most? What a great recap — I wish I’d been there. Hopefully next year! I love that the contest judge sought you out. That is just too wonderful. 🙂 Thanks for sharing all the great info, and congrats on all the requests. Fingers are crossed and double-crossed for you! Sounds like you had a fun time! Great to know a fellow CC finaled in Greater Seattle’s ECO contest. I belong to the chaper and they’re wonderful people. Oh cool!! I owe CC such a huge debt too. Thanks for stopping by! It was great meeting you. I could not believe how busy the conference was, but it was so much fun. I know what you mean about the name recognition, I had more than one person I didn’t know mention my blog and FB page. It was great meeting you too! It was definitely overwhelming and I did feel a little disjointed at times, but it was all worth it. I had such a great time with you guys. I didn’t expect to have so much fun! Such a smart and funny group of women! I’ve been in a bit of a funk since returning home. Hopefully, I’ll snap out of it and write my own recap at some point (and return all of those emails.) My only regret is not taking more pictures. I can tell how much fun I am having by the lack of pictures when I get home. The one thing that stood out is the feeling of camaraderie. I felt it even before I arrive at the hotel just by accidently sitting between two writers on the shuttle from the airport. RWA fosters an amazingly supportive writing community. I was truly impressed. Sounds like you had a truly awesome time, Angela! Wish I could have been there. Would have been nice to meet Tessa in person. Did you know she was my beta back in our Loungers days? I’ll never forget her condensed version of P&P. So proud of her, and you! Would have been nice to meet you in person as well. Didn’t mean to leave you out! Oh, the chocolate, the books, the writers! 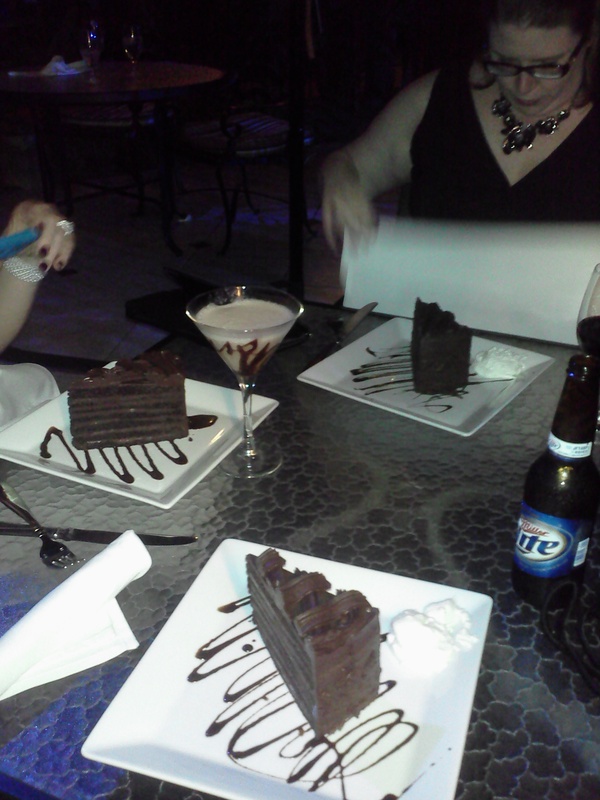 It looks like RWA 2012 was amazing. I love that you’d just had the thought “Meeting great writers like her makes me really wonder what the heck I think I’m doing trying to write” and then met someone who’d read Must Love Breeches recognized you and wanted to meet you! It’s the little things like this that give us confidence as writers to just keep trucking. 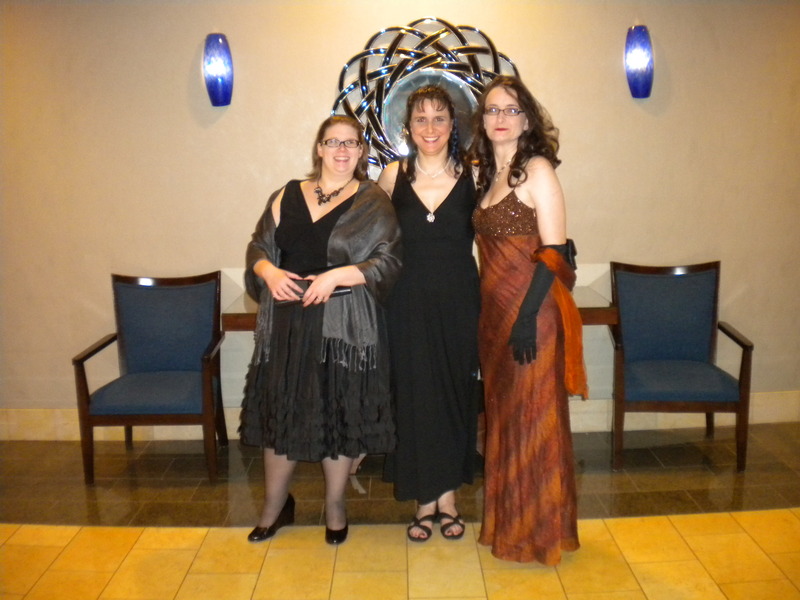 Glad the RWA was such a success! Wow! It sounds like you had an amazing time! With all your contest wins and agent interest in Must Love Breeches, I predict great things in your future! Isn’t validation wonderful? My you are tall!! (I’m very short) and that’s a lovely dress. Wow! Wish I’d been there! Saving my pennies for the one in Atlanta next year. And congrats on two more finals! 😀 I’m amazed at how many ‘small world’ moments you seemed to have had. That’s pretty awesome.